Sire, How Much Would You Spend to Stop the Next Arab Spring? The Arab Spring has been, in turns, exhilarating and excruciating. It has also been expensive—even for relatively peaceful Middle Eastern countries. Three Gulf countries sent a $12 billion aid package to Egypt in July, the latest in a regional spending spree that has also benefited the troubled countries of Yemen and Tunisia. And the Gulf governments—the richest in the region—have been spending even more within their own borders to keep their citizens content. Some of their quietest but most important outlays have been on popular domestic measures like government housing, debt relief, and welfare programs. Within a year of the Arab Spring’s outbreak in Tunisia in December 2010, the Gulf states’ governments were already spending, on average, nearly 20 percent more on “current expenditures” (the economic lingo for one-time expenses that can’t be recouped, as opposed to long-term investments, like infrastructure). This spending–which is mainly collected by citizens, not foreign residents—is, by and large, still rising. 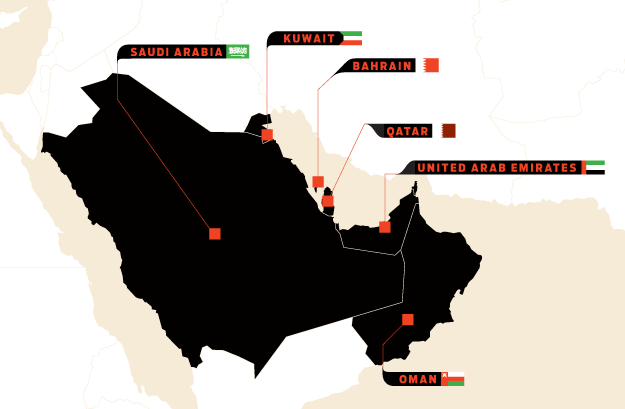 Here’s a look at what each Gulf state has spent to ensure stability at home as uprisings erupt in the neighborhood. In Egypt, Gulf countries have become the donors of first and last resort. Money from the Arabian peninsula has outpaced U.S. assistance more than fivefold. The Gulf governments don’t always agree, however: Qatar was more supportive of the Islamist government of Mohamed Morsi, while its neighbors stepped in to back the military. *Totals are based on pledged amounts and do not include in-kind donations, whose values have not been reported. Demonstrations have erupted sporadically in the east, home to a large Shia minority. Other small groups have protested individual grievances, like the indefinite detention of terror suspects. King Abdullah announced $130 billion in new social spending, including a minimum-wage hike. He also pledged to build 500,000 subsidized housing units and create 60,000 new jobs. Qatar has one of the most comprehensive welfare systems in the region and arguably the world: The government picks up the tab on most services, including health care, housing, education, and pensions. The government raised civil servant wages by between 60 percent and 120 percent. The cost of the pay hike was estimated at $2.75 billion. Kuwait’s opposition mounted a series of large protests demanding political reforms, culminating in late 2012. The largest rally was estimated at 100,000 people, but demonstrations have since quieted. Each citizen received 1,000 Kuwaiti dinars (roughly $3,500) and free food staples for the next 13 months, at a cost of $5 billion to the government. The government agreed to raise wages by 25 percent for the public sector, where roughly three-quarters of the citizen workforce is employed. Government grants have long been available to newly married couples. In 2012, the grant grew to $7,200, as did the right to $21,500 in loans newlyweds receive to start their households. Bahrain has been the most turbulent of the Gulf states. Shia demonstrators opposed to the Sunni-led government first took to the streets in 2011. Protests are ongoing, with small demonstrations on a near-daily basis. Its oil supplies largely exhausted, Bahrain has had to make cuts to long-term investments to free up money for current expenditure measures. To help, its Gulf neighbors pledged Bahrain $10 billion. Shortly after the Arab Spring broke out, the government approved a 15 percent public-sector raise. The current legislature is pushing for another 15 percent raise for public employees and 29 percent for retirees. Since 2011, the government has accelerated its construction of government homes, which many newly married couples are legally entitled to but must sometimes wait at least 15 years to obtain. Since 2011, the federal budget—mainly funded by Abu Dhabi—has increased transfers to the less affluent northern emirates, including a promise of $1.55 billion for water and electricity infrastructure. The UAE government agreed to pay off up to 5 million dirhams ($1.36 million) in unpaid loans for heavily indebted citizens. In 2011, protests erupted in numerous cities across Oman. Demonstrators largely called for reform of the regime, rather than its overthrow; the rising cost of living was a chief concern. The government raised the minimum wage for all private-sector workers by 43 percent. The Sultan approved a 60-million-rial ($156 million) program to offer small-business loans to unemployed citizens interested in starting their own companies. Subsidized housing and other construction projects have also accelerated, keeping the economy growing at a steady 5 percent in 2012.